The bar in Auburn where Seth Carey had invited Bates College students to come after Saturday's football game against Colby cancels the party. 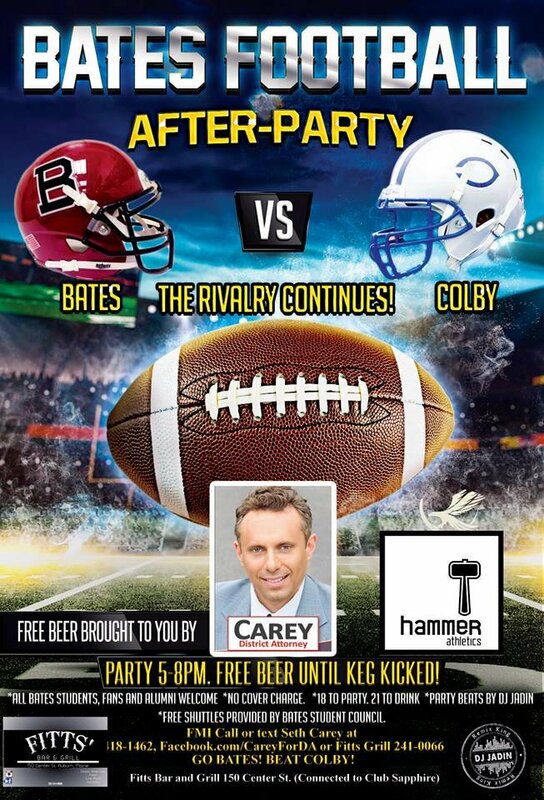 Republican district attorney candidate Seth Carey’s plan to snag some extra votes by holding a free keg party for Bates College students fell apart late Friday when the owner of the Auburn bar that was to host the event pulled the plug. Carey had tried to arrange free rides to and from the Lewiston campus in a bid to encourage as many students as possible to attend the party scheduled for Fitts’ Bar & Grill after the football game between Bates and Colby on Saturday. “Bates students are the biggest bloc of Democrats that I want to flip to my side,” Carey said Friday before his plans fell apart. Carey had planned to distribute invitations to the private party at the game at Garcelon Field, as well as spreading the word on social media and through friends. Carey, whose law license has been suspended over allegations of sexual assault, is challenging Democrat Andrew Robinson, a career prosecutor who took office in 2014 in an uncontested race, in the Nov. 6 general election. 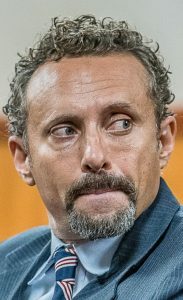 Carey, who has protection-from-abuse orders issued against him to stay away from two women, faces hearings in November that may lead to the loss of his law license. District attorneys must be able to practice law in order to qualify for the job. Despite that, Carey has said he’s aiming to win on Election Day and, if all goes well, to take office Jan. 1 as the next district attorney for Androscoggin, Oxford and Franklin counties. Offering free beer to football fans struck Carey as “the best way” to make inroads into the mostly Democratic vote at Bates. “I was going to the game, anyway, and it just came to me,” Carey said. He said it made sense to squeeze in a celebration between the gridiron matchup with a longtime rival and Game 4 of the World Series between the Boston Red Sox and the Los Angeles Dodgers on Saturday night. Carey decided he would get a keg of Bud Light, and arranged to hold the party at Fitts’ Bar & Grill at 150 Center St., which is the same location as Sapphire Nightclub. He said he would co-sponsor it with his new athletic clothing company, Hammer Athletics. Carey said he would probably give away some shoes to those attending to spread awareness of the new brand. Carey’s poster and social media posts said the “Bates Student Council” was going to provide free rides for students. There is no such thing as the Bates Student Council and a representative of the Student Government at Bates said his group is not involved. Regardless, Carey had said there would be plenty of designated drivers because many students are not 21 years old and therefore not legally allowed to drink. It’s not clear how many students had planned to attend. On his event page on Facebook, it initially appeared he might be drawing a crowd, with 122 people indicating they planned to attend. But a quick perusal of the likely attendees found that nearly all of them live in Brazil.